Is your 911 Carerra or first-gen Boxster giving you more trouble? High-performance German sports cars offer a classic, timeless and authentic driving experience, but often at the price of frequent repairs. If you’re tired of taking your Porsche to yet another foreign car repair center, you might want to consider looking into your friendly independent Porsche mechanic team here at HOUSE Automotive. While we reside in the Pasadena area, HOUSE Automotive also serves other areas of Southern California including Thousand Oaks and Beverly Hills. By owning a Porsche, you’ve demonstrated that you have good taste as a driver, and you care about the driving experience beyond getting from Point A to Point B in a 60mpg econobox. HOUSE Automotive respects that you’re a passionate driver, but we also believe that your Porsche deserves the right attention and specialized service from our team of independent Porsche specialists. All we do is work on Porsches exclusively, so your Panamera, Cayenne, 911 or other model of Porsche is in good hands with us! In today’s blog post, let’s take a look at a few things that make a good automobile mechanic. When you go to check out a car repair shop, there’s a lot to judge based on appearances. While you shouldn’t judge a book by its cover in most situations, finding the right mechanic is a different story. The walls should be lined with tools, but are they neatly kept and organized? Are those nasty used air filters and used oil drums stored carefully and out of the way? Is the shop well-lit and well-maintained? The appearance of a local auto shop can give you insight into how they run their business and if they run it with any sense of pride and respect. This isn’t even exclusive to auto repair businesses – all reputable businesses take pride in their appearance. Keep all of these considerations in mind when checking out a shop, because what you notice will be representative of the quality of service that you and your Porsche get. You’ll want to have a person working on your Porsche who you can easily trust and talk to. Experience and know-how are huge aspects of being a successful Porsche mechanic, but they’re not everything. Don’t be afraid to get friendly with the mechanic team at a local shop to see what their backgrounds are, what their credentials are, and if they really have a passion for their work. There are many dedicated Porsche enthusiasts and other German car enthusiasts (think VW, Audi, BMW and Mercedes) here in the Pasadena area and beyond. While many of these gearheads have tools and a garage to work on their precious Porsches themselves, some of them enjoy cruising around as much as the next guy but still get their Porsche serviced at a local specialist shop like HOUSE Automotive. It’s a well-known thing that talking to real, live human beings (car enthusiasts, no doubt) is still the best tried-and-true way of getting mechanic recommendations. Your responses might be a little biased, but they will come from passionate individuals who know what they’re talking about. In many situations, a high turnover rate is a bad thing. However, in the context of a local auto repair business, you don’t want to see a bunch of half-repaired cars out in the parking lot for weeks at a time. Not only does a heap of junker cars out front physically look bad for the business, but it also shows that the turnaround time on major repairs is not good. When you scan the mechanic’s lot, you’ll want to see a large number of cars in healthy condition that regularly change and cycle through. Generally speaking, this means that the mechanics know what they’re doing. 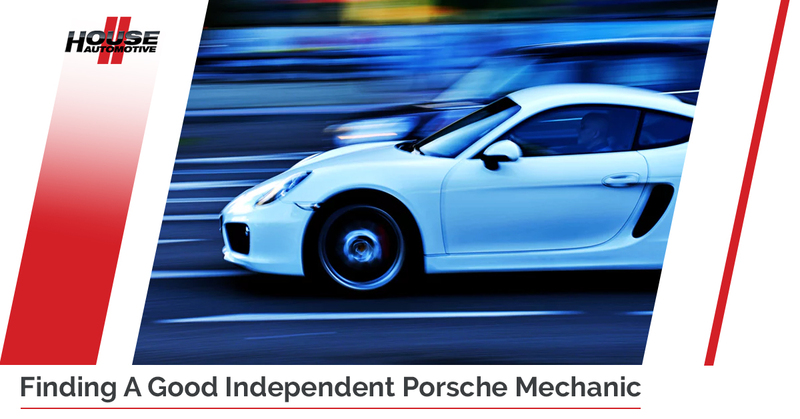 Ask a local Porsche enthusiast about our independent Porsche mechanic services and they’ll say nothing but good things. Care to learn more about our independent Porsche service? Discover more about our personalized service here.